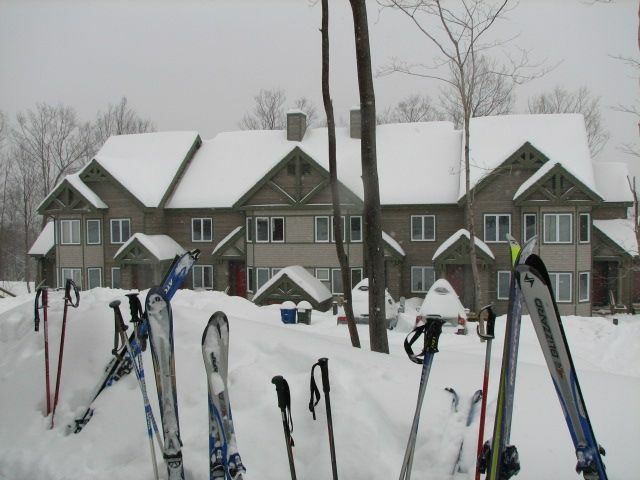 Beautiful Jay Peak Resort Village condo located on the mountain in the Village along side the Grammy Jay Trail. Amenities include: 2 large bedrooms, 2 magnificent bathrooms, gourmet kitchen fit for entertaining, gas fireplace, living room with cable TV w/ Blue-ray, DVD, free high speed internet, whirlpool master bathtub, washer/dryer and deck. Unit is loaded with kitchenware & linens. All you need to bring are your skis. Perfect for families or small groups. This unit sleeps 6 comfortably. Ski storage is provided. Enjoy VIP access to the Grammy Jay trail, steps from your door. Jay Peak has invested hundreds of millions of dollars in base lodge and ski area improvements over the last few years improving the quality and diversity of resort activities. Recent additions include an indoor water park, an ice rink, base lodges and restaurants that are great additions to the world class skiing. Stay with us and experience the best of Jay Peak with a VIP address on the mountain. Jay Peak offers skiing for all abilities. The location of the condo in the Village along the Grammy Jay Ski Trail is perfectly suited for beginners with long gentle trails and what feels like a private lift that accesses the entire mountain. The location is also convenient for the experts in the family who want a launch pad to the steepest and deepest terrain in the East. For more info on Jay Peak Resort please visit their website. I am a long time Jay Peak skier (25+ years) and jumped at the opportunity to own a home at the resort when expansions began. What a wonderful ski home! Since purchasing the condo, we have experienced the other little known benefit of visiting Jay Peak. The beauty of summer and the challenge of the Jay Peak golf course. As the mountain continues to expand we look forward to all of the new amenities for our guests to enjoy. Direct Access to Jay Peak Resort. Lift tickets sold separately. Jay Peak's award winning golf course is at the base of the mountain. Round fees and carts sold separately. Slopeside Village ski condo located directly on the Grammy Jay Ski Trail at Jay Peak. Ski-in/Ski-out with a convenient ski locker at the front door. Jay Peaks’s best kept secret! Had a wonderful time staying at this unit. Ski in/out was so convenient. The unit was very spacious and neatly kept. Exceeded all my expectations! .So convenient to the Jay Peak Resort. The shuttle bust will take you where you need to go so leave your car at the unit! Had a few questions on arrival and Ryan answered them right away. Thanks for a great stay. We would definitely reserve here again! We had a great time, the condo was perfect well equipped the only thing there was only a small amount of dish soap we ran out and ask for more and they gave us an almost empty bottle again. Unit was clean, functional and highly convenient. We had stayed at this unit before and we were happy to find that it was as we remembered. Unit was great and check-in, check-out was super easy. Great communication from ownership/management. We recently visited Jay peak resort for school vacation week. This is an annual trip for us and the first time staying in this unit. It’s a great ski in ski out spot close to all amenities in the resort. The excitement grows for the day when the groomers come by the condo every morning. The condo is beautiful and well equipped with everything you need for the week. Thank you and we hope to stay again in the future. The unit is clean and roomy. Everything is in working order. Ski in and ski out is great. It has everything needed for stay, clean and convinient. This condo is on the Jay Peak Ski Resort property directly on the Grammy Jay Ski Trail. With this ski-in/ski-out location, you will not need to move your car at all during your stay. Our guests have said it is the best location on the mountain. You can drop your skis just steps from the door and you are off.